Its so exciting as the new Seasonal Mini is released tomorrow. Keep your eye out for the post and see all the new items. 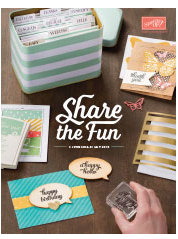 The new Seasonal Mini, coupled with Sale-A-Bration is a great way the earn free products on a $120 spend. Here's what the catalogue looks like. The link to download it will be available tomorrow.